Noam Sapiens is the Vice President of Science and Technology at EyeQue. An esteemed technologist with extensive experience leading projects and teams towards innovation, he is pushing cutting edge technology to the forefront of eye care. He has shared a blog post that explains how a human eye works and how we use that to create our EyeQue technology and research. Most of us wake up every morning and open our eyes without even thinking about it. But what we don’t know is just how complex our eyes are. The human eye is an amazing organ that works together with the brain to receive and process visual images. Did you know that the human brain can process entire images that the eye sees for as little as 13 milliseconds? This means that the eyes are shifting gaze as fast as possible to send information to the brain AND allow the brain to think about it rapidly enough to know what you should look at next. A diagram on how the eyes and brain work together to process visual stimulation. How Does the Human Eye See? Light rays enter the cornea (a clear tissue at the front of the eye) and travel through the pupil (a hole inside your eye). The iris (the colored part of your eye) then either shrinks or enlarges the pupil like a camera shutter depending on how much light there is. The light then passes through the crystalline lens that can change its shape. This allows it to focus the light properly as a camera lens does. Once the light travels through the vitreous (a gel-like transparent liquid), it reaches the back of the eye to the retina. 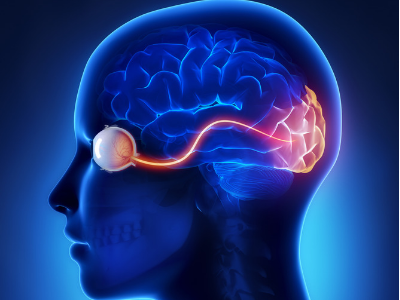 The retina receives the image and transforms it into electrical impulses that are carried by the optic nerve to the brain. Below, is a video about how eyes help us see and why some of us have blurry vision that requires vision correction. This process of sight is one that is complex; we need every part of the human eye. For example, if your lens starts becomes less flexible with age, you suffer from presbyopia. The eye cannot focus the light from close up objects onto the retina. It is increasingly difficult to focus on up-close objects. To build accurate refraction measurement equipment, we have to be able to simulate refraction errors just like this. That is why we have developed the EyeQue Eye. It is an automated human eye model that was designed and built for testing and validating refraction measurement equipment. It allows us to visualize various ocular conditions including, but not limited to, myopia, hyperopia, astigmatism, and accommodation. How Does the EyeQue Eye Work? It is built to work just like the human eye. The automated eye model is comprised of an optical system that is aimed at providing refraction control and a camera serving as the retina. The automated eye model is built in a similar fashion to the human eye anatomy, to the extent possible. 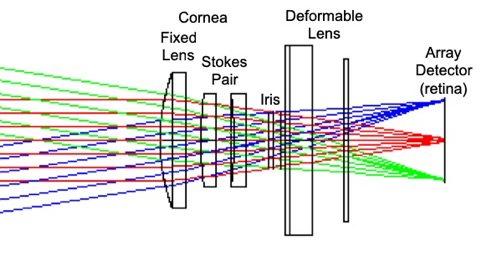 The optical system consists of lenses serving as a cornea equivalent, an iris that controls the pupil size of the automated eye model, and a variable focus lens serving as the eye lens. The camera is mounted on a linear stage to account for different eye sizes associated with various conditions. The refraction control is achieved by changing the variable lens power and the cornea lenses arrangement. Ray tracing simulation for the automated eye model. The automated eye model is a tool that we will use to ensure that our products are as accurate as they can be. By simulating what the human eye sees when it suffers from refractive error, we will be able to test, measure, and ensure that our refraction measurement tools are valid. This means accurate numbers for you so that you can see clearly. If you would like to learn more about what our products can do, visit our Products section. How Do I Know If I Have Computer Vision?